He's proposing a November ballot measure that would overturn Oakland's voting system — and potentially help him challenge Councilwoman Rebecca Kaplan. Oakland City Councilman Ignacio De La Fuente has long opposed ranked-choice voting. And on Tuesday, July 17, he will ask the city council to place a measure on the November ballot that would overturn the voting system. De La Fuente has contended for years that ranked-choice voting, also known as instant-runoff voting, or IRV, is a flawed process for selecting political leaders. But he has more to gain from a ballot measure than just overturning a voting system he opposes. It could also benefit him politically, and allow him to win elections that he might otherwise lose. According to two City Hall sources, De La Fuente is considering a run against Councilwoman Rebecca Kaplan this November for her at-large seat. If he does challenge Kaplan, then he would have to give up his own District Five council spot, representing the city's Fruitvale and Glenview districts. However, an anti-IRV ballot measure could boost his prospects against Kaplan, because it could allow him to effectively circumvent the city's campaign spending laws. De La Fuente's campaign manager, Larry Tramutola, would likely run his anti-IRV campaign. As such, Tramutola and De La Fuente would be able to raise unlimited funds for the anti-IRV effort, and then feature De La Fuente in ads touting the ballot measure — thus giving him free publicity for his run against Kaplan. By contrast, if there were no ballot measure, then De La Fuente would have to abide by the city's strict spending rules for city council races. An anti-IRV measure, if approved by Oakland voters in November, also would likely boost De La Fuente's chances for defeating Mayor Jean Quan when she runs for reelection in 2014. De La Fuente said that he would challenge Quan this year if there were a recall election, but now that the recall efforts have failed, the longtime councilman is expected to take on the mayor when her first term is over. However, ranked-choice voting, if it remains in place for the 2014 election, would present challenges for the moderate De La Fuente. Polls have shown that many Oakland voters — particularly progressives — have a negative view of him, in part because of his repeated calls over the years for gang injunctions and curfews, and because of his demand for a tougher police crackdown on Occupy Oakland last fall. De La Fuente also has made enemies within the labor community for his hard-line stances against public-employee compensation packages. As a result, he would likely have a tough time in a ranked-choice-voting election because to win he would need lots of voters to list him as their second or third choices on their ballots — as Quan proved in 2010. De La Fuente did not return phone calls seeking comment for this story by press time. But Kaplan said she opposes his proposal to put an anti-IRV measure on the ballot. Kaplan noted that ranked-choice voting saves the cash-strapped city a lot of money because it eliminates the need for a June primary. The system also improves voter turnout because lots more voters cast ballots in November elections than in June primaries. "It's going to cost an extra $1 million," said Kaplan of doing away with IRV. "And it will reduce voter participation." It should be noted that Kaplan was elected to the council in 2008 under the city's old primary-runoff system. She then lost her only IRV election, coming in third in the 2010 mayor's race behind Quan and ex-state Senator Don Perata. Many Perata supporters, including his longtime close friend and ally, De La Fuente, blame IRV for Quan's victory. But Kaplan contends that Perata lost because he ran a horrible campaign. The former senator skipped most of the mayoral debates, and when he did show up, he turned in lackluster performances. He also blew the Oakland Tribune endorsement interview. It's unclear, however, whether De La Fuente has the five council votes he needs to get his anti-IRV measure on the ballot. He has the support of his good friend, council President Larry Reid, who put the anti-IRV proposal directly onto the council's agenda, bypassing the usual committee process. Councilwomen Jane Brunner and Desley Brooks, neither of who supports ranked-choice voting, also may back De La Fuente's plan. However, the four other councilwomen — Kaplan, Pat Kernighan, Nancy Nadel, and Libby Schaaf — all have supported ranked-choice voting in the past. When the state Legislature approved Jerry Brown's proposal last week for high-speed rail, many legislators contended that the plan to release $6 billion in state bond funds would boost California's lagging economy. They're right, it definitely should. The construction jobs alone will help reduce the state's high unemployment rate. In addition, the plan to electrify Caltrain will finally put that system on solid financial ground. But there's also no doubt that high-speed rail is a big gamble. The chief reason is that the $68 billion project will require substantial federal subsidies to be completed. So far, the Obama administration has awarded $3 billion to begin construction on a section of high-speed rail in the Central Valley. In fact, Obama's Transportation Department threatened to give that money to another state if the California Legislature had rejected Brown's plan. But any future federal funding will be dependent on Congressional approval. And right now, that seems doubtful. 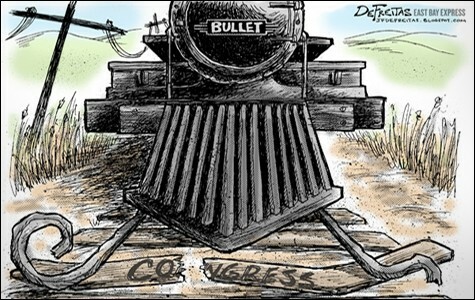 Congressional Republicans adamantly oppose bullet-train funding, and because they control the House of Representatives, no additional federal money will be coming to California anytime soon. Moreover, most political observers predict that the GOP will retain control of the House this November, and thus will hold power over the country's purse strings for at least two more years, and potentially even longer than that. As a result, the initial 130 miles of track to be built between Bakersfield and Madera really could become the Train to Nowhere — if no additional federal funds are forthcoming. That's one of the reasons why three state Democratic senators, including Mark DeSaulnier of the East Bay, who sat on the high-speed rail oversight panel, voted against the governor's plan. 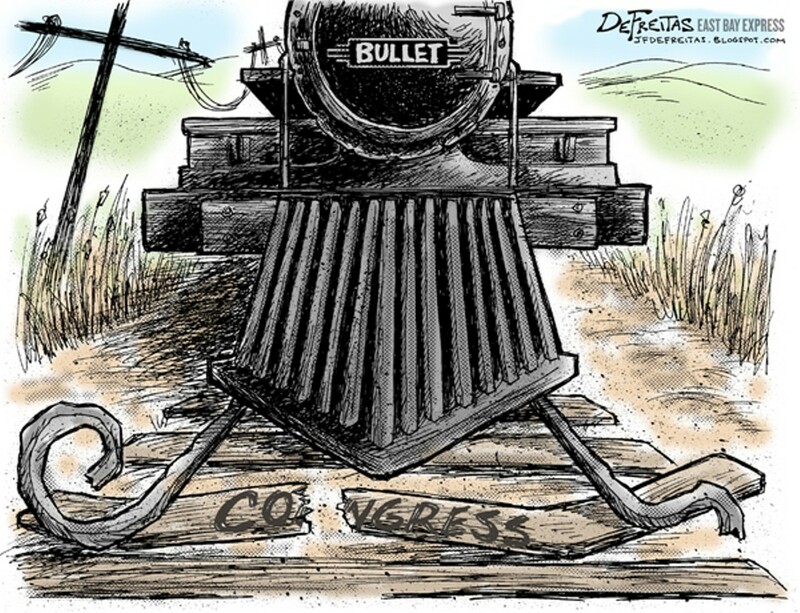 In other words, Brown is gambling that at some point in the near future Democrats will once again control both houses of Congress and the White House at the same time, and will agree to award billions of additional dollars for the California bullet train. It could happen, but at his point, it looks like a long shot.